A properly installed and maintained roof is very important for your home. If you have a poor one, it can become a serious threat to you and your family. Besides that, damaged roof can also be a potential health issue. In the text below, you will find tips on how to deal with the roof that may be damaged and dangerous. Many roofs can last from 20 to 50 years, all depending on the level of inspections and maintenance programs. But, even if your roof appears to be in a good shape, that doesn’t mean that it doesn’t hide any damages under the surface. There are several things you should know about if you have a roof that has over 15 years. Weather conditions and natural elements can affect your roof very seriously. You can check the roof surface using the binoculars, or if you have more experience, you can use a ladder and climb up on the surface. But be very careful using the ladders and follow all the safety precautions. Check if there are any missing, broken or curled shingles. If there aren’t many missing shingles, the repairs can easily be done. But, be aware and consult with a professional for choosing the right color, because shingles are available in a variety of colors, shapes, and sizes. And you might choose the wrong ones. Cracked and broken shingles are often a result of a high winds. If there are only a few cracked, it is easy to replace them, but if you find a lot of broken and damaged shingles, you should consider arranging a professional inspection to determinate if you need a roof replacement. When the roof surface is damaged, a professional help is needed, and small repairs are done in 3 to 5 days. Curled shingles are a sign that your roof is in danger. Leaking, moisture and algae growth are signs which are showing you that the water penetrated your home. Water stains on the walls and ceilings are a sign that you need to contact a professional for further help. The granules in the gutters are not a big problem but must be repaired in a short time. These granules protect your shingles from the sunlight, the UV rays, and other weather conditions. If the protective layer is off, the shingles easily start to break and deteriorate. If you found any signs of sagging, that may be a structural issue. This problem could be connected with the house supporters and the attic decking. For this type of damage, you need to contact and hire a professional because the damage can rapidly progress. All of the tips listed above can help you with the inspection. We also recommend contacting a professional who can make a real estimate and guide you through the inspection. 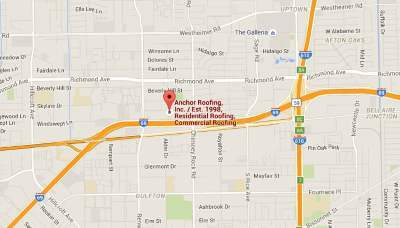 If you are looking for more information, feel free to contact us, because we are here for you for any additional concerns or questions, Anchor roofing, Houston TX roof replacement company has the capabilities and experience important to finish tasks and projects of any roofing project. We offer to the clients the affirmation of getting both brilliant material, craftsmanship, and workmanship. We aim to give you the best service available and to protect the value of your home and your roofing for many years.